After planting my first commercial vineyard in nineteen eighty-five, and starting Nebraska’s post prohibition wine industry by opening the first winery in December of nineteen ninety-four, I admit that there have been a few years along the way that I’ve become somewhat complacent, and a little bored. It’s what happens when you don’t challenge yourself. I would never say I have quit learning–that’s something you do everyday if you’re paying attention. If you haven’t guessed by now that I’m Ed Swanson, Les and Trish’s winemaker; then I’ll apologize now for the tease. It’s a great pleasure working with two people who not only have the zeal for the challenge that Nebraska is, in raising grapes and making wine, but also for their love of working with, being around, and teaching people. This is simple; when you’re around people having fun, it rubs off. We will be breaking new ground in the Nebraska wine industry, in releasing new grapes from my grape breeding program that will further the industry as a whole, and place Capitol View Winery as a innovator. How many seasons does it take to fill a Nebraska Year? If this were a multiple choice question “a.” would be 4, and “d.” would be 16. The answer is 16. We have Summer in February, and winter in May, and this confuses the grapes in the vineyard. 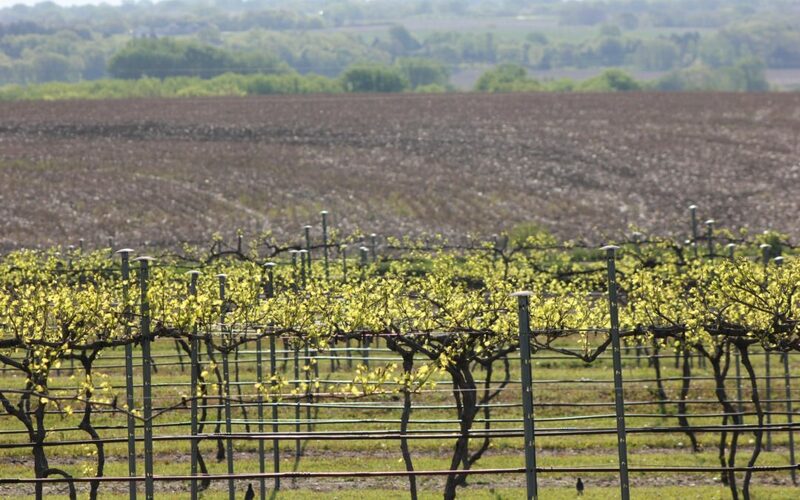 Some vines south of the Platte should be blooming soon, and look behind right now, but if we get back into the 90’s soon, things may straighten out to what we might call normal Nebraska weather–whoops, normal and Nebraska weather would be an oxymoron. As Nebraskans we complain about this state of flux, but we stay here, and I think it makes us more interesting. In the future I’ll let you know some of the processes that take place as we go through the year, and you can learn with us, and in the end; taste what you see and hear, as it comes to fruition. Meanwhile, keep an eye on our calendar so you can take part in the fun things planned in the months ahead. Hope to see you at the winery, and would love to answer your questions in person. Thanks for being a part of Les and Trish’s dream.